Custom Metallic shimmer t-shirt printing are specialty inks used to make unique custom t-shirts. Kirkwood Trading Company is a pioneer in printing unique and specialty ink tees. With over 20 years of experience we have had a lot of time to experiment and perfect various inks and their ability to separate our customers t-shirts from the rest of the pack. Although specialty inks and ordering custom metallic shimmer t-shirt printing is a little more expensive than traditional plastisol inks, they really hold their value because they are so unique. Metallic colors are available in silver, gold, red, blue, green, and black. The metallic shimmer offers a good amount of sparkle on any design, although ideally you want a design with a large ink application, so bolder fonts and images compared to thinner script or small ink deposit designs. It works collectively over a larger surface area to really get the shimmer to pop. On glitter ink prints the same print surface requirements remain but with the glitter ink you get a higher wow factor in the amount of shimmer that pops off the ink. These are great for brand clothing, specialty shirt designs, and in general when you want to get a message across from the standard inks. Custom metallic shimmer t-shirt printing is a unique aspect of what the Kirkwood Trading Company does. Because of a few additional requirements in order to make the ink pop, the cost is slightly higher but with anything custom, the more you buy the less each piece is. Custom metallic shimmer t-shirt printing is a great value when done correctly and can bring a lot of exposure to your custom t-shirts. 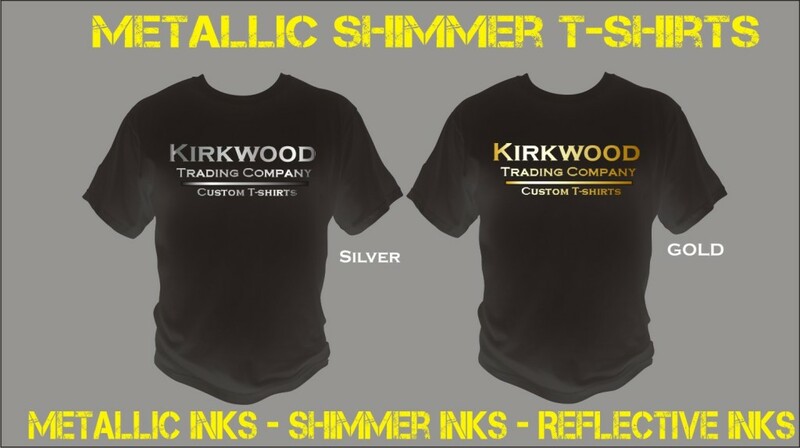 Contact Kirkwood Trading Company with any questions or an order you would like to get quoted using metallic shimmer inks and we’ll be happy to walk you through the process and explain the difference in the inks. We’ll look at your artwork to determine if it’s a candidate for this specialty time of screen printing.